The Abbots Ann village Shop is run by the community for the community and any profits are returned into investment in the shop and other community projects, so the shop actually runs on a not for profit basis. The shop is Managed by a team of two, Manger Tim Abram , and deputy Manager Carol Murphy, and operated by an army of volunteers resident in the village. The post Office is run by Sub Post Mistress Maureen Flood and her team. We need your support in becoming a member of the shop Association, Volunteering or just coming to use the shop and Post Office facilities. We try and keep our prices as competitive as possible and in many cases as just as good as the supermarkets for every day products but we also stock Fresh and local products from small suppliers around the area including Leaf Tea, Salami, Cheeses, Home Made Cakes, and Watercress. History Until November 1998, Abbotts Ann had a commercially run village shop and Post Office. When the shop failed as a business and was sold, it was decided to approach the residents with the suggestion, to retain the facility in the village. The new owners allowed part of the original shop to remain so that the Post Office Counter and Shop could remain on a temporary basis until an alternative sight could be found. It was most important not to loose the contract with the Post Office. Our first port of call was to ViRSA (Village Retail Services Association) for guidance. Trade continued from the front room 10ft sq for nearly 3 years with the assistance of 26 volunteers. Within a very short time the turnover was increasing to very satisfactory levels. Proving that there was hope for the future of the shop. The Abbotts Ann Village Shop Association A questionnaire went out to every household to get a response on the idea of keeping and supporting a new facility. Each reply was monitored and logged. A new site had to be found. 4 sites were thoroughly investigated and the findings were reported back to the villagers in a meeting at the village hall, which David Fisher (ViRSA) and Martin Harvey (POL) attended. The attendance and response was overwhelming. In April 1999 the residents of Abbotts Ann formed The Abbotts Ann Village Shop Association Ltd, (a non profit making organisation registered under the Industrial and Provident Societies Act No 28922R), whose main objective is to provide and retain a village shop & Post Office for the benefit of the villages and surrounding area, as a community venture. The concept was supported by both county and borough councils, and was in line with Government policy to retain rural facilities. In 2001/02 the Government pledged to retain rural Post Offices and a Capital Subsidy Grant was implemented to help finance the halt of Post Office closures. The Financial Situation The total project cost was approx £300,000. This included the purchase of suitable land, the building of a new Shop and Post Office in keeping with the conservation area in which it is situated, the shop fitting, installation of the Post Office Counter and the stock. Based on the best projections available it was clear, initially, that our borrowing requirement would be approximately £141,000 in order to construct the village shop as desired even after we have sold off the rear building plot. By incorporating a flat above the shop, a rental from the flat would service a £70,000 mortgage over 25years, but this still left £71,000 to find. Fundraising became a major issue. Update April 2003 We have now been trading for 6 months and have far exceeded expectations. We have employed a Manager 30 hours a week and are recruiting for a sales assistant for 25 hours a week. The off licence is very popular with our customers but not as much as the bakery department. We bake on site every morning and take orders to save disappointment. Our fresh fruit and vegetables are supplied by a local grocery, Kenyons, who delivers daily. Mead and Stent Butchers of North Baddersley, provide us with top quality meat, fish and cheese. They deliver to us on a Monday, Wednesday and Friday lunchtime. Orders can be placed during the week for collection on the days mentioned. Homemade flans, pies, scones and cakes are delivered every Thursday, orders need to be placed by Tuesday morning to save disappointment. Pendoves of Poole call in every Tuesday and Thursday morning to collect and deliver Dry Cleaning/ Laundry, shoe repairs and photo processing. Flowers and plants are supplied through Simon Heaton in Wherwell every Wednesday/ Thursday. We also have the ability to deliver flower through the Post Office service Bunches. June 1999 – Registered as a Limited Company under the Friendly and Provident society. Raised £73,000 through a mixture of memberships, grants, donations and loans from the village, to purchase a plot of land (known as the Old Cob Barn) for the new venture. July 2001 Delay on tenders as builders asked for extension. Sudden loss of a dear friend and supporter of the project Mr Basil Hibbert whose wife Susan asked that donations should be made to the Village Shop project. The Building Process During the period that lay ahead, poor weather and many hurdles delayed the building programme on more than one occasion. We were very fortunate to have on our committee an Architect, and a Surveyor, who put in many hours with the project manager to make sure that everything was being done correctly and to plan. Our Chairman, a Solicitor, is another very valuable member of the team with his legal knowledge. It vital, to have expert advise available for this type of project. 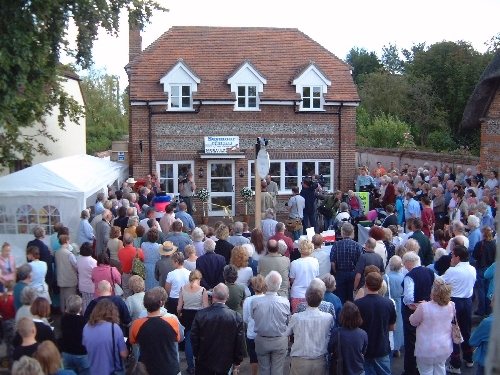 The Grand Opening Took place on Saturday 7th September 2002 at 1pm, by Martyn Lewis (Newsreader) during the Village Fete. Click to view. Many thanks to Sean Arkley of Palmer and Harvey Distributions, Fareham and his colleagues for organising the stock and planning the opening day with so many promotions. What fun we all had!!!! Thank you also to South Today, Meridian News, Meriden TV and Radio Solent for covering the opening. To Sir George Young for his continued support of rural facilities and to the residents of Abbotts Ann for making it all possible.